Sunset over the Red Sea. 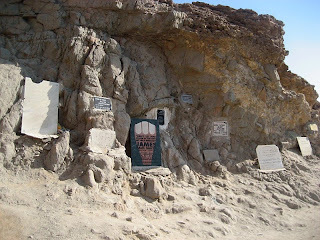 One of the first things that you hear about Dahab is that people get stuck there. They come for a couple day and stay for months. Instead of two focus days of diving, we ended up there for four long days of lazing and diving. 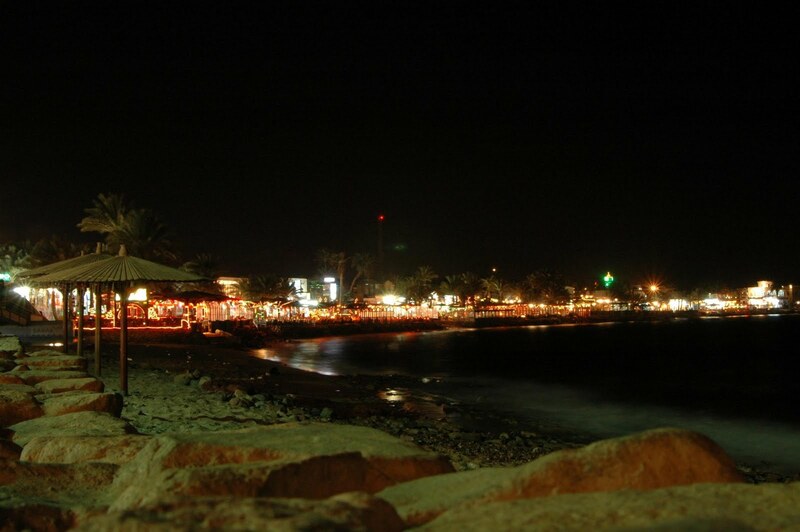 The Dahab boardwalk at night (photo from Internet). The woman, who referred us to our dive center at the hostel, thought Betty would be able to use her referral and finish her open certification in two days. She thought I would be able to get set up to and visit all of the dive sites I wanted to see in two days as well. That wasn't the case. It would take three days for me to get set up. Also, the dive center would not accept Betty's referral so she would have to do a full three day course. Then, if we wanted to climb Mt. Sinai we would have to do no diving for a 4th day before going up for the night. We weren't thrilled, but we finally felt like we had the time. 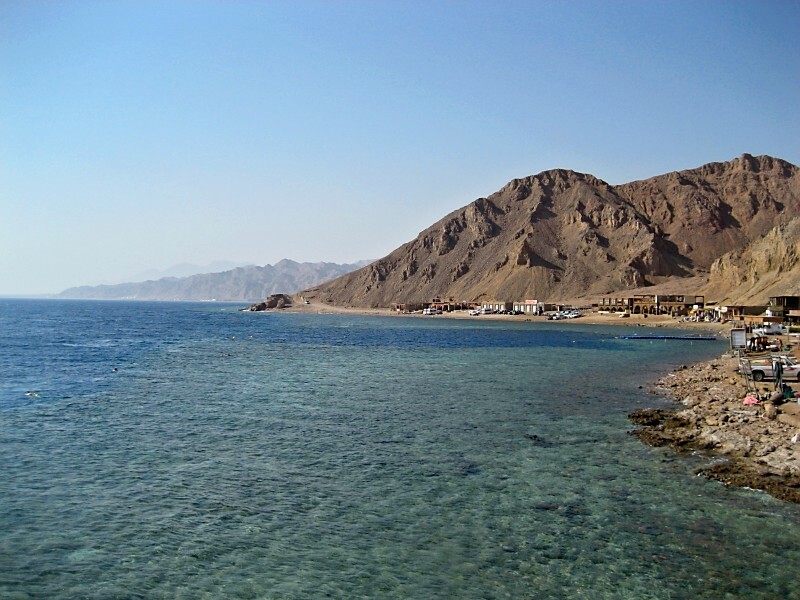 The easy access to great diving and snorkeling in Dahab is amazing. We were eating dinner on the boardwalk when we saw this guy walk in from snorkeling. Betty got right to work on her certification. I went to entertain myself until they could take me to the Lighthouse dive site for a refresher course and naturalist dive for my advanced open water certification. That night, we wandered around town a little bit. The boardwalk was lots of restaurants aimed at the tourist crowd. It reminded me of a boardwalk anywhere in the western world. However, the first street off the boardwalk was definitely Middle Eastern. It was interesting to see these two style butting up against each other so successfully. Our second day turned out a bit better than the first. Betty spent most of the day at Lighthouse acing the rest of her dive course. She finished in two days instead of three. I got to head out with Ann, a dive master from Australia, to two dive sites, Blue Hole/Bells and Canyon. The Canyon dive site took me down to 28m for the first time. It was pretty neat to drop down there where no one else was. It didn't feel any different that other depths, but I'm sure that is just because I don't know what to notice. My second dive at the Blue Hole/Bells was really cool. We walked into the water, swam out to the reef, dropped down 30m through a 'chimney' that exited along a reef wall that drops down to 800m!! You can't see the bottom. If you look out to sea, you can't see anything but water. It was a little intimidating to have the great wide open in all but two directions (towards the wall and up). I needed the reef wall to keep my bearings. We swam along the reef wall until we got to a saddle where you can easily enter the Blue Hole. The Blue Hole is the dark blue water right in front of the buildings. The lighter colored water is much shallower. Dahab's Blue Hole is the dark blue spot in the middle. (photo by B. Cremmins). The Blue Hole is right off shore. If you don't enter from the open sea side via the saddle, you can walk out to it. It only drops to 130m instead of 800m, but when you are diving, you are encircled by walls. It is supposed to be the most dangerous dive site in the world. This is only half true. If you don't push yourself beyond your limits, the site isn't dangerous at all. However, lots of people use the Blue Hole to try and push their limits because of its easy access from shore and its proximity to a major diving town. Some people want to try to get down to 100m. Others want to find and pass through the tunnel at 60m from the Blue Hole out to open sea even though the recreational diving limit is 40m. In retrospect, the Blue Hole gets all the fame, but the Bells was the best part of the dive. It was teeming with life. The Blue Hole didn't have a lot of coral or fish left. The best part of the Blue Hole was probably coming back to the surface and seeing and dodging the dangling legs of snorkelers in the water. Dead divers plaques beside the Blue Hole (photo by B. Cremmins). An incredible free dive of the Arch at the Blue Hole. I don't remember doing much that night. For some reason, diving is exhausting. You try to move as little as possible to save oxygen, but you still come out tired. Some people say it is from breathing the air in the tanks instead of regular air. Some say it is the extra pressure of the water. I just say it is time for a nap. Our gear on the dive boat. Day three saw me heading to Sharm el-Sheikh at 3am to catch a dive boat to three dives at a shipwreck and national park.. At the shipwreck, we would do two dives. The first would be around the outside of the hull. The second one would be into the ship itself. 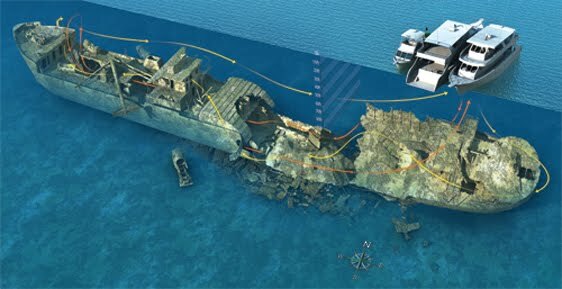 The wrecked ship, the SS Thistlegorm, was a British vessel being used to transport military supplies. It was bombed while anchored. The way it exploded has made it very easy for divers to get in and out. Unfortunately for me, it isn't quite easy enough. 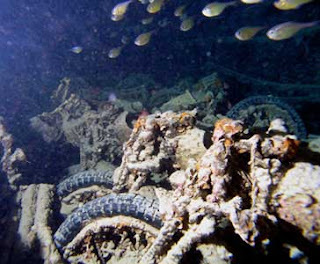 BSA motorcycles and their inflated tired aboard the shipwrecked SS Thistlegorm (photo from Internet). A mock up of the SS Thistlegorm shipwreck dive site (photo from Internet). There was a small hatch that we were using to navigate between two levels of the ship. I was not moving fast enough and received a push from below which forced me to reach out and grab something to keep from going up too fast. The piece of metal that I grabbed was really sharp. I ended up bleeding for the rest of the day. I still have a scar. On a much cooler note, you could still see motorcycles and trucks in the storage part of the vessel. You could see the anti-aircraft gun on deck. There was an air pocket in a cabin that we each took turns poking are heads into, but making sure not to breath in the old air. 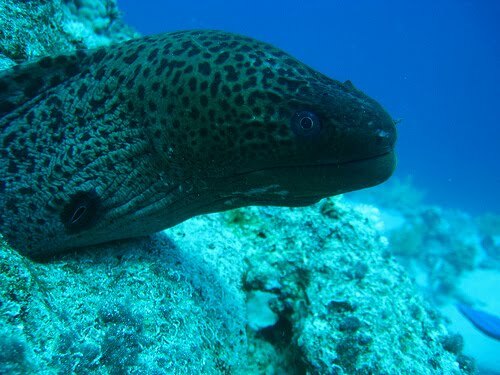 Giant moray eel (photo from Internet). On the way back to Sharm el-Sheikh, we made a final drift dive at Ras Mohammed National Park where we got in at one place, but got out at another. At this dive site, you are hoping for big currents because they bring in the big animals, but we did not get them. We did get to see another wreck that was hauling bathtubs and toilets though. It was strange to see that stuff piled up on the ocean floor. On this dive, I also got to see my first giant moray eel. It was huge! I'm sure my eyes made it to be bigger than it actually was, but it easily looked 1 foot around its head and 10 feet long. We saw 4 of them. They have a bad reputation for attacking people, but a lot of those attacks are from when humans mess with their burrows or in poor visibility when a finger might look like a fish! I kept my distance. The old market of Sharm el-Sheikh. Eh. After returning to port, we had a quick look around Sharm el-Sheikh. It was supposed to have all of Dahab's diving mixed it with some ritz. It didn't seem that much different than Dahab. 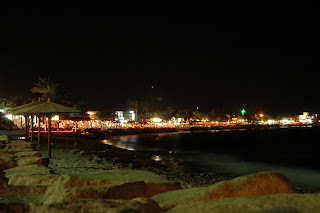 The beachfront was taken up by western style hotels that were far beyond anything Dahab had, but when you got away from the water, it was the same. I didn't like it. However, it was definitely a diving mecca. The number of dive boats in harbor was ridiculous. The Sharm el-Sheikh dive boat harbor. That night Betty raved about her visit to the Blue Hole. She was definitely hooked on diving. We celebrated at a burger joint run by a Kiwi woman with a couple other travelers. It was my second Kiwi encounter of the day. On my dive ship, there was also a Kiwi from Ashburton. I was excited to be done with Dahab. I had really enjoyed my diving, but it was time to move on. I definitely wanted to stay in one place, but Dahab was not the place for me. I'm not sure why even though I'd love to go back for more diving or to try windsurfing and kite boarding.